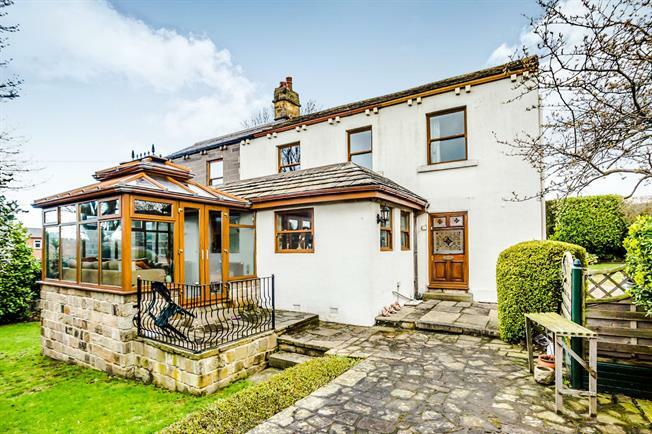 4 Bedroom Detached House For Sale in Wakefield for Offers Over £350,000. Spacious 4 bed detached cottage with large extension in need of finishing off but offering lots of original features. The property offers a new purchaser the chance to put their own stamp on this spacious property and features to the ground floor conservatory, spacious kitchen/diner, 4 piece bathroom, 2 x entrance hall, spacious living room (in need of finishing off) and a very large and spacious extension room (in need of finishing off). To the basement is 2 x cellar rooms and to the top floor of the property is 2 x double bedroom ( one needing finishing off), good size single bedroom and a new spacious master bedroom with en suite space in the new extension which also needs finishing off. The property is accessed by a private gravelled drive way leading up to the electric gates. The property has a large parking area for around 4/5 cars and large gardens to both sides of the property. The property has double glazing, central heating and is available with no chain. Spacious entrance hall with tiled floor, large wooden door and radiator. Spacious living room with double glazing and in need of re-plastering and finishing off. Spacious fitted kitchen with wooden base and wall units and black worktop, built in washer, fridge/freezer and range cooker. Wooden styled flooring and 3 x double glazed windows. UPVC conservatory with wooden style flooring, 2 x central heating radiators and patio doors leading to garden area. 4 Piece bathroom with large shower room, roll top bath with tiled floor, heated towel rail and double glazed window. Good size double bedroom with built in wardrobes, 2 x double glazed window and central heating radiator. Large and spacious bedroom with en suite room in need of finishing off with 4 x double glazed windows.